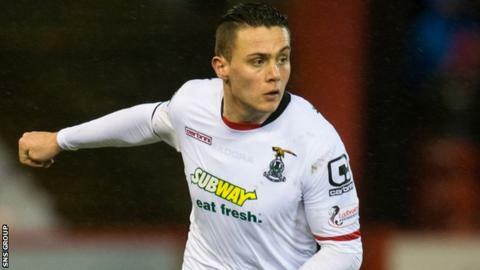 Inverness Caledonian Thistle have extended the loan stay of Miles Storey until the end of the season. The 22-year-old striker has netted eight goals in 16 games since his arrival from Swindon in September. The last of those came in the derby win over Ross County on 2 January. Writing on Twitter, Storey said: "Delighted to get everything done and continue with @ICTFC until the end of the season. Need a big second half to the season now." The initial deal was due to expire after Saturday's Scottish Cup trip to Stirling Albion. Swindon, 16th in English League One, are currently without a manager after the resignation of Martin Ling.